April Fool’s Day was recently upon us, and in celebration most would like to watch as many comedies as possible. However, given the sheer number of comedy films, people could still be viewing comedies a full two weeks after the holiday. Therefore, it would be much easier and simpler to just narrow it down to the one movie that actually played a joke on its audience. I am referring to the 1984 film This Is Spinal Tap, a faux documentary about the fictional band in the movie’s title. There were many who didn’t recognize the fictional aspect of the movie and took it to be a genuine documentary about an actual band. (Although following the movie’s cult success, the cast members began touring as Spinal Tap) There are even some who, despite knowing that the film is fiction, describe it as more of a tragedy than a comedy, due to its many similarities to real bands and their ultimate fates. U2’s The Edge said , “I didn’t laugh, I wept. It was so close to the truth.” (This Is Spinal Tap- Trivia- IMDb). Despite this, This Is Spinal Tap is commonly considered to be both one of the best comedies of all time, as well as one of the best rock movies of all time, with Empire Magazine naming it the 48th best film of all time and Time Out London calling it the best comedy ever. That said, does This Is Spinal Tap still hold up 31 years later? 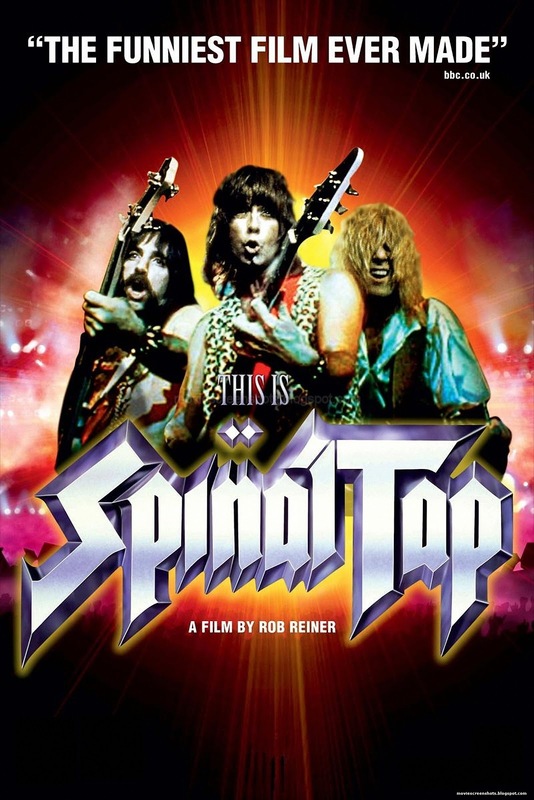 This Is Spinal Tap follows the band of the movie’s title on a 1982 tour as documented by filmmaker Marty Di Bergi promoting their new album Smell The Glove. Additionally, the movie satirizes the behavior and pretentiousness of rock bands of the time, and the infamous incidents that contributed to their downfall. One of the strongest points of the movie is obviously the amount of jokes and how hilarious they are. You don’t have to be a rock expert to enjoy (most of) the jokes, although prior knowledge does make it more enjoyable. (Such as a scene where a band member plays his guitar with a violin, which some may not recognize as a sendoff of Led Zeppelin’s Jimmy Page using a bow; or a deceased drummer choking on vomit that wasn’t his own- poking fun at the death of Jimi Hendrix and Zeppelin’s John Bonham). The movie also has an added level of realism due to the extreme amount of improvisation and ad-libbing, making the dialogue seem spontaneous rather than rehearsed. (So much improvisation was done for the movie that a 4.5 hour version exists among collectors) There are so many scenes that will have you falling out of your seat it’s impossible to count, but the most iconic is definitely the one where guitarist Nigel Tufnel shows off his amplifiers that have 11 as the maximum volume, which is “one louder” than the standard of 10. As mentioned previously, despite the amount of comedy in the movie, the vast amount of similarities between Spinal Tap and real bands also adds a sense of tragedy and commentary on the absurdity of many rock bands. One example is the relationship between guitarist David St. Hubbins and his girlfriend Jeanette, similar to that between John Lennon and Yoko Ono which was one of many factors resulting in the Beatles’ breakup. The amount of dead drummers the band has over the years (Which would be around 30) is only too similar to the many untimely deaths within rock music, as well as the always-changing lineup of the Rolling Stones. (The latter is also supported by the band’s manager and Tufnel quitting) And since Spinal Tap is not supposed to be a great band but still has popularity, the movie made a decent prediction of the state of today’s music. Since the film is a parody of bands of the time, the band is not intended to be great. So it’s a bit of a surprise that the soundtrack is actually really good. Then again, it does help that the cast members playing the titular band are all competent musicians. Although it’s not up to the standard of the Beatles or Led Zeppelin, the songs in the film can be pretty catchy, such as “Hell Hole” and “Tonight I’m Gonna Rock You Tonight.” It’s no Sgt. Pepper, but it does its job, and it’s fun to listen to.